The Bone Student Center serves as the gateway to campus and the hub of campus activities. Adjacent to the Bone Student Center is the Bowling and Billiards Center and a 500-space parking lot. 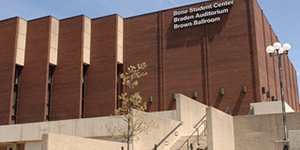 Braden Auditorium is connected to the Bone Student Center and seats 3,457. It offers premier entertainment for the University and the community. The Bone Student Center is named after Robert G. Bone, President of Illinois State University from 1956–67, whom many say knew every student’s name on campus. In 1973, the Illinois State University Union and Auditorium was constructed. During the University’s 125th Anniversary Celebration in February of 1982, the facility was renamed the Bone Student Center and Braden Auditorium; honoring Dr. and Mrs. Robert Bone (President 1960–1967) and Dr. and Mrs. Samuel Braden (President 1967–1970). The Bone Student Center and Braden Auditorium stand as a reminder of their dedication and commitment to the University’s students.